I love the flavours from Middle Eastern spices and herbs, and this Moroccan dish captures those aromas and tastes. Moroccan cuisine has influences from all over the Mediterranean, but particularly Berber and Andalusian cooking styles. The spices and herbs used in this recipe, cumin, cinnamon, saffron and mint, are typical of Moroccan cooking. The chicken is succulent and tender with crispy skin - serve the chicken with the vegetables and sauce poured over a dish of couscous. Serves 2. Heat the oven to 200°C/180°C fan/400°F. Add all the vegetables and spices into a 20x30cm roasting tray, and mix well to ensure everything is coated in the spices. Pour the chicken stock over the vegetables, and mix well. Using a sharp knife, cut large slashes in the skin and flesh of the chicken joints and place these on top of the vegetables. Cover the cooking tray with aluminium foil and cook for in the oven for 1 hour. Remove the cooking foil and cook for a further 35-40 minutes until the skin is crispy and the liquid is a little reduced. When the chicken is nearly finished cooking, make the couscous. Place the couscous and spices in a large bowl with a good pinch of salt. Mix well, and pour over enough boiling water to cover - about 200 ml. Leave to stand for 10 minutes. When ready to serve, loosen up the couscous with a fork. 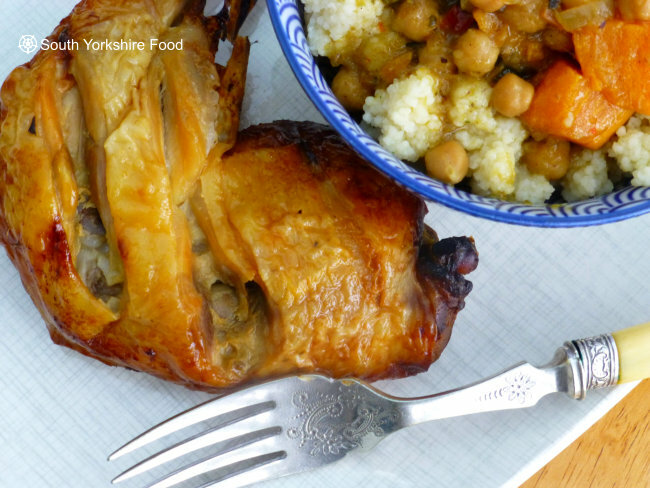 Serve the chicken with the couscous on the side, with the vegetables and gravy poured over it. To feed more people use a bigger roasting tray, and increase the quantities, but do not use more than 750 ml of stock.